Whoever placed those two pieces of signage in such close proximity to one another, aside from having an eye for collage, also has a clear grasp of the political moment Salazar’s candidacy for the state Senate exemplifies. Salazar is one of those millennial socialists, and her opponent in the Sept. 13 primary for District 18’s North Brooklyn Senate seat, Martin Malavé Dilan, is among a number of establishment Democrats now in surprising danger of losing their positions. The old stalwarts of transactional politics, political machines and unions, just aren’t as powerful as they once were. Or at least, as recent events signal, they aren’t much of a match against a candidate with a real ground game who catches the ardor of voters. Who would’ve thought? Talking to people face-to-face about meaningfully improving their lives pays off. That’s the Democratic Socialists of America’s (DSA’s) strategy, and it appears to be working. In Virginia last November, DSA member Lee Carter defeated the incumbent Republican House of Delegates majority whip, and this May, four DSA members clinched primary victories in legislative races in Pennsylvania. 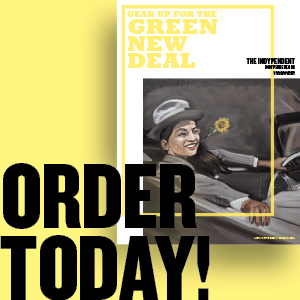 But the group’s most impressive electoral achievement to date came in June, when 28-year-old Alexandria Ocasio-Cortez upset longtime Queens Democratic party boss Joe Crowley in a congressional primary. DSA activists knocked on doors by the thousand for Ocasio and helped knock down Crowley, who was widely expected to someday succeed Nancy Pelosi as the top House Democrat. The Queens-Bronx district is heavily Democratic, so the win all but ensures Ocasio will have a place in Washington. “Our ability to mobilize people is a threat to all corporate politicians,” says Abdullah Younus, co-chair of DSA’s 4,000-member New York City chapter. The organization has seen its national membership jump from about 5,000 to 47,000 since Donald Trump’s election in 2016. Millennials, disenchanted with mainline Democrats and feeling a sense of urgency, have swarmed into its ranks — and more so since Ocasio-Cortez’s stunning victory. DSA has thrown itself into the Salazar campaign. Like Ocasio, who is one year her senior, Salazar hails from a working-class background. She was raised by a single mother, with what she terms “conservative bootstrap politics.” Those politics influenced her to register as a Republican when she first signed up to vote in 2008. Her own life experiences soon set her on a different political path, though she wasn’t a registered Democrat until last year. Members of the Democratic Socialists of America and numerous community groups are getting word out about Salazar ahead of the Sept. 13 primary. Credit: Erin Sheridan. Salazar has been working since age 14, getting her first job at a grocery store and cleaning homes to supplement the financial aid she received while attending Columbia University. That’s where she says she found her class consciousness, reading Karl Marx and later attending study groups hosted by the socialist magazine Jacobin. 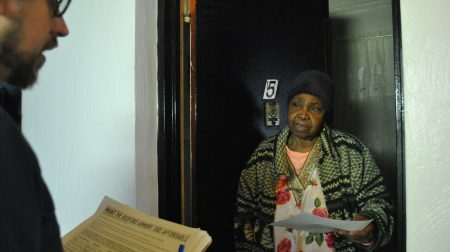 She was already an activist by then, having organized her fellow tenants in a campaign to force their landlord to make repairs and turn on the heat in the winter. Her campaign for the state Senate — calling for a Medicare-for-all health care system, immigrant rights, stronger rent protections and an end to cash bail — is an extension of that initial impulse, says Salazar, who is on a leave from Jews For Racial & Economic Justice, where she has worked since 2016 on anti-police brutality initiatives. The 18th District stretches across northeast Brooklyn, from Greenpoint and Williamsburg through Bushwick, Bed-Stuy, Cypress Hills and East New York. Its demographics — 49 percent Hispanic, 26 percent black and 19 percent white — are similar to those of Ocasio’s district, where Hispanic voters and younger white millennials who voted en masse for Bernie Sanders in 2016 broke heavily for the challenger. Like Ocasio, she is highlighting the gentrification and the soaring rents that are affecting both old and new North Brooklyn residents. 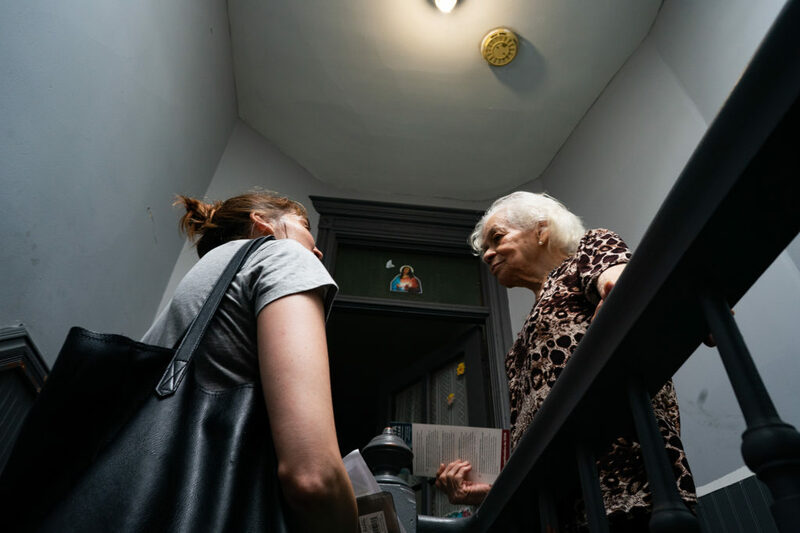 She’s promising to bring their voices to the center of the debate next year, when state rent laws that affect more than 2 million New York City tenants will be up for renewal in Albany. “Affordable housing is an issue that affects every inch of the district,” she says. In Malavé Dilan, Salazar faces a wily old political boss who inherited the remnants of Vito Lopez’s North Brooklyn machine. Dilan has been a state senator since 2002, and served on the City Council for 10 years before that. His son Erik took over his dad’s seat on the Council before moving to his current perch in the state Assembly. Facing a strong challenge from Salazar, Dilan launched a two-pronged attack on the Salazar campaign, as The Indypendent went to press, disputing the validity of the petition signatures she collected to qualify and claiming she did not meet the state’s residency requirement to run for office. The Salazar campaign says Dilan is grasping at straws. Dilan was challenged from the left in 2014 and 2016 by veteran tenant organizer Debbie Medina, who reached 42 percent in her first campaign but saw her second run unravel amid news reports that she had beaten her son with a belt. While serving on the Council in 1994, Dilan voted in favor of high-rent vacancy decontrol, which enabled landlords to take vacant apartments out of rent stabilization if the rent is high enough, giving them a huge incentive to harass and evict tenants. Along with a similar state law enacted in 1997, it has cost the city more than 150,000 rent-regulated apartments. Dilan has since expressed regret for the vote and sponsored pro-tenant bills in Albany, but has also continued to take campaign contributions from the real estate industry. 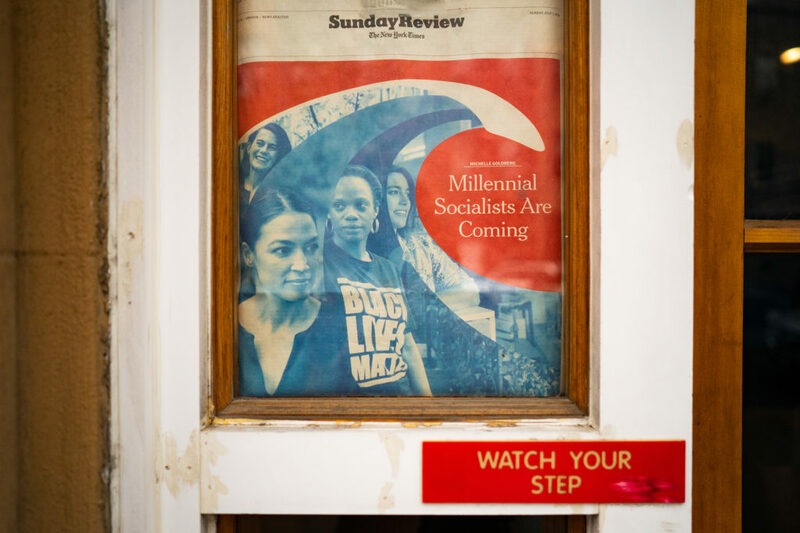 Young socialists like Salazar and Alexandria Ocasio-Cortez are capturing the imagination of voters overburdened by the strain of capitalism and disillusioned with the establishment. Credit: Erin Sheridan. Salazar is one of a legion of left-leaning candidates running for state office this year in the hopes of cleaning up Albany, where a confluence of Wall Street and real-estate money and a deeply entrenched political class have rendered New York state government among the most corrupt in the country for decades. The most high-profile of these challengers is actress Cynthia Nixon, taking on Gov. Andrew Cuomo in the Democratic primary. Taking note of what DSA helped accomplish with the Ocasio campaign, she paid its members a visit in July, seeking their endorsement. 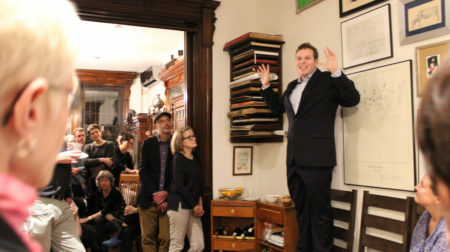 Nixon, a longtime education activist, already had bona fide progressive credentials, but all of a sudden asserted that she had “democratic socialist values.” DSA endorsed her along with progressive City Councilmember Jumaane Williams, who is making a bid for lieutenant governor, but not until after a heated debate. Many in the organization find Nixon’s supposed support for socialism a bit of a stretch. Yet the fact that a high-profile candidate like Nixon would embrace ideas that once elicited visions of Stalinism in American minds indicates how far socialism has risen in the public’s estimation and how much political clout DSA is garnering. But the organization’s growth and electoral success have also posed new strategic challenges. Banished from the mainstream political arena in the United States, Marxism has survived — barely — through two main poles of activity. 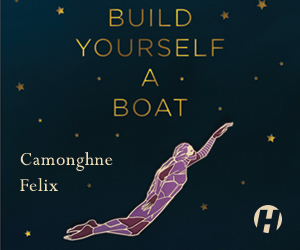 One, in academia; the other, through small grouplets whose members, never numbering more than a few hundred, tout a near-unified political outlook and attract recruits in ones and twos through social-movement activism. Socialism has thereby avoided sullying itself with the form of political activity Americans engage in most: the two-party electoral process. It has maintained its ideological purity while managing to be awesomely irrelevant. Not that fears of engaging with the Democratic Party aren’t well founded. It has a way of vacuuming up social movements’ energy and subverting the outcomes activists are fighting for. DSA is an attempting a new method of electoral engagement. Through its backing of Bernie Sanders’ presidential campaign and by heeding Sanders’ call for progressives to run for office and take over the Democratic Party, DSA has thrown itself in the political muck, but, as Younus explains, its doorknockers remain independent of the candidates’ operations. The group’s activism and its electoral work feed off each other. This process begins before DSA even endorses a candidate. The organization’s myriad, issue-focused working groups — racial justice, immigrant justice, housing, “Medicare for all,” postal banking — submit queries that appear on a questionnaire all candidates seeking it’s endorsement are asked to fill out. It has 90 questions, including some on specific pieces of legislation that DSA members are fighting for, like the New York Health Care Act, which would set up a single-payer system in the state. This ensures that DSA vets whether politicians are in line with its objectives. It also “makes it that much easier to go out and knock on doors and speak to what hurts you and what will connect with that voter at that door,” said Younus. 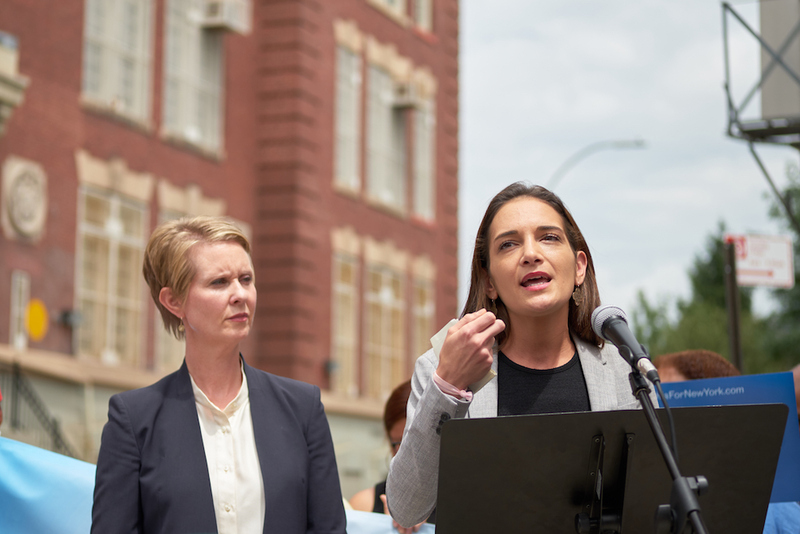 Julia Salazar, right, speaks at a rally with gubernatorial candidate Cynthia Nixon on July 26. Both campaigners are challenging their entrenched opponents from the left. Credit: William Matelsk. Salazar herself is one such activist. When she was deciding whether to run for office earlier this year, she wasn’t sure she could afford to do so. Salazar has a real chance of winning in the Sept. 13 primary. She has endorsements from fellow insurgents like Nixon and Williams, as well as incumbent officeholders like City Comptroller Scott Stringer, Rep. Nydia Velázquez (D-Brooklyn) and Councilmembers Antonio Reynoso (D-Brooklyn) and Carlina Rivera (D-Manhattan). 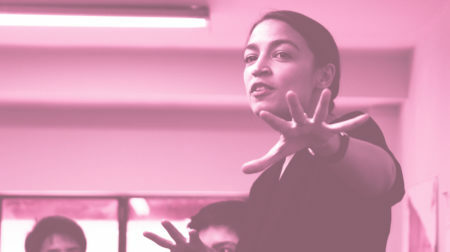 She’s received a deluge of media coverage from reporters looking for the next Ocasio and has volunteer canvassers from DSA and a number of community groups blanketing the district. According to her most recent campaign filings, Salazar has raised more than $120,000, none of it from corporations. As the race enters the home stretch, she has nearly twice as much cash on hand as Dilan. But as for revolution, that’ll be an uphill battle years in the making. Mainline Democrats still control many thousands of elective offices at the city, state and federal level; almost all of the national, state and county committees; and access to enormous financial resources and institutional networks. Most current Democratic officeholders have the advantages of incumbency and name recognition. Yet DSA has offered a model that can be replicated, especially in heavily liberal areas where the Democratic machine has done a lame job. That has pushed some establishment Democrats to move to the left on issues like “Medicare for all,” free public college education and criminal justice reform. 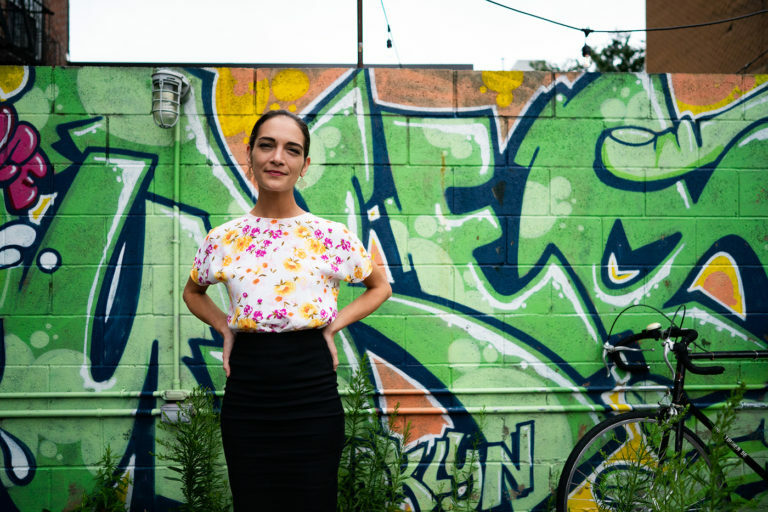 Photo (top): Julia Salazar. Credit: Erin Sheridan.